FNB Wits are now serious contenders in this year’s Varsity Cup competition. 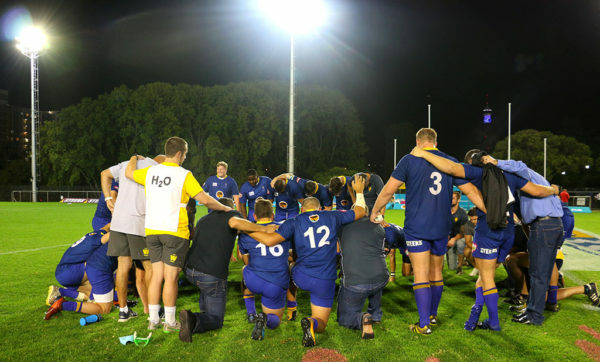 FNB Wits brought their A-game to the Wits University Rugby Stadium on Monday, February 5, beating defending champions FNB University of Pretoria-Tuks 25-19. It was FNB UP-Tuks right centre Toko Seerane who opened the scoring for the opposing team after dodging a few FNB Wits players and picking up a pass from left wing Xolisa Guma, putting the ball into touch in the seventh minute. Fly-half Tinus De Beer secured the early lead 7-0 for the visitors from Pretoria through the conversion. 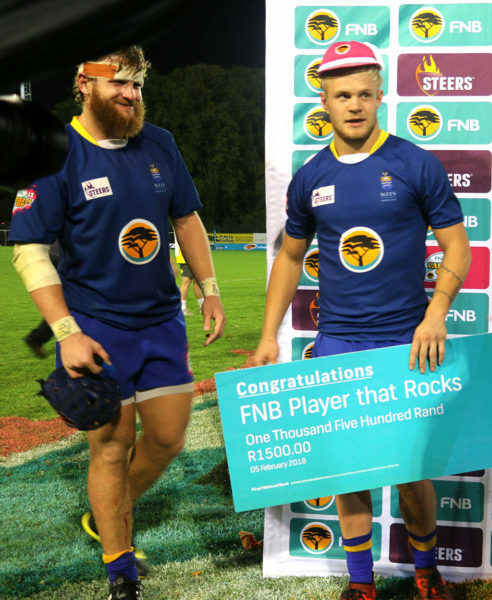 However, FNB Wits stuck to their game plan and almost immediately requested the new Power Play, with FNB UP-Tuks’ Tinus De Beer and left centre Christo Hamman leaving the field for two minutes. Things began to look up for the hosts as right centre Sicelo Champion tore through the visitors’ defence to score a try which was successfully converted try by fly-half Christian Humphries. FNB Wits then took a 9-7 lead in the 12th minute. FNB Wits carried on with their scoring ways with a superb run from Humphries who off-loaded to right wing Kwanele Ngema to score the try which Humphries then converted , leaving Wits in the lead with 18-7. However, the defending champions retaliated before the end of the first half with left wing Xolisa Guma scoring in the corner to bring the score to 18-14 at halftime. The second half saw FNB Wits return continue the momentum with a quick try through left wing Daniel Kasende Kapepula, giving the hosts a strong 25-14 lead. After much back and forth FNB UP-Tuks managed a final try scored by Guma which proved a little too late and guests were sent home without a win. The game ended 25-19. FNB Wits coach Hugo van As was clearly pleased with his team’s performance. “We are very chuffed. It’s two weeks in a row now. The team played extremely well and we are blessed to be in this position,” said van As. FNB Wits full back Tyrone Green also walked away with the Player that Rocks award. Wits Politics Honours student Phindile Skosana, a fan of the home side, shared the coach’s sentiments. However, he believes the FNB Wits team was a bit sloppy and could have done better. “They played well but there is always room for improvement. I think they made a lot of mistakes. Despite that, they must keep it going, keep pushing and do their best in every single match,” said Skosana.